The Internet is a wonderful thing, not least because, were it not to exist, your blogger would have to go out and find a proper job. But, like all inventions, it does have its drawbacks. Have you ever tried to have a political argument online? If so, you likely noticed that the people with whom you engage are cursed by arrogance, wilful blindness and an inability to see the obvious. What's most frustrating is the way in which your opponents quote facts and figures that you regard as questionable, cherry-picked or downright misleading. For example, if you're arguing with a Republican, she's going to tell you that Robert Barro, a Harvard economist, has calculated that extending unemployment benefits to 99 weeks has added 3 percent to the jobless rate. But if you're arguing with a Democrat, he's going to insist that that number is actually 0.4 percent, a figure suggested in recent reports published by the Federal Reserve Bank of San Francisco (FRBSF) and Goldman Sachs. Barro or the FRBSF and Goldman Sachs? Of course, you know which analysis is right: the one that agrees with your personal Weltanschauung (world view). As Winston Churchill once observed: "Statistics are like a drunk with a lamppost: used more for support than illumination." For some time after the credit crunch hit, industry observers (including this writer) read the Federal Reserve's monthly releases of consumer credit statistics in a very simple way. These showed that revolving credit, which is nearly all credit card debt, kept dropping--month after month, quarter after quarter, year after year--and everyone celebrated American families' newfound restraint, responsibility and thriftiness. Credit card companies are "charging off" (industry jargon for writing off) billions in uncollectible card debt, and passing it to collection agencies. And all that money is deducted from the revolving credit figures just as surely as when cardholders pay down their balances. So how much is actually being paid down, and how much is being written off? Credit cards not being paid down? Gradually that question came more and more to occupy the minds of those who watch the credit card industry closely. Some dismissed the idea completely, while others went to the other extreme, claiming that consumers hadn't on average paid down their card balances at all. Many people in the financial services industry believe charge-offs have been the leading factor in declining credit card debt since the start of the recession. In fact, some have stated that charge-offs account for the entire change in card balances over the past two to three years. In reality, the dynamic is more complex. Our analysis shows that consumers have made a concerted effort to pay down their credit cards during these uncertain economic times. TransUnion cited a December 2010 Federal Reserve study in support of its findings. And this certainly showed a decline in credit card use over the period 2006-2009, when the value of payments fell to $1.9 trillion from $2.1 trillion. 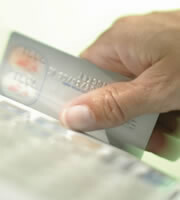 However, that in itself reveals little about credit card debt. It's perfectly possible to imagine a scenario in which one group, the wealthy and the prudent, switched to debit cards while another large group (the unemployed, the overstretched and the plain spendthrift) continued to build up balances, possibly at an accelerated rate. No, the clincher here, if there is one, is TransUnion's access to those actual--though anonymized--credit card accounts. It's presumably from these that researchers tracked the fall in the average cardholder's balance to $4,679 (a 10-year low) in the first quarter of this year, from $5,165 during the same period in 2010, and $5,776 during the first three months of 2009. A trawl through the Fed's archives puts TransUnion's headline figure of a $72 billion reduction in card debt between the first quarters of 2009 and 2010 into perspective. They show that revolving credit overall fell by $94.4 billion during that time, which suggests that credit card companies wrote off only $22.4 billion in uncollectible loans that year. Can that be right? No doubt other researchers are already working on that question, determined to challenge TransUnion's findings. 0 Responses to "Lies, damned lies, and credit card debt statistics"